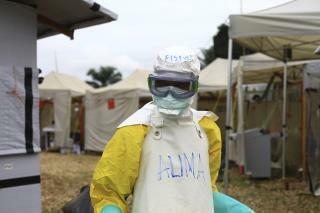 (Newser) – For the first time since Ebola was identified in 1976, the disease could become a persistent presence. Centers for Disease Control and Prevention Director Robert Redfield warned Monday that the new outbreak in Congo is so severe it may not be containable, the Washington Post reports. Most previous outbreaks have happened in remote areas, and all of them were brought under control before spreading widely and becoming entrenched. If the current outbreak, which has racked up almost 300 cases including 186 deaths as it enters its fourth month, becomes endemic in enough areas, "this will mean that we’ve lost the ability to trace contacts, stop transmission chains, and contain the outbreak," said another expert at the Capitol Hill briefing where Redfield spoke. This cradle of human evolution is a real basket case.